Here is the Holy Grail of success philosophy: Napoleon Hill's complete and original formula to achievement presented in fifteen remarkable principles--now newly designed in a handsome single-volume edition. This is the master volume of the extraordinary work that began the career of Napoleon Hill. Originally produced by Hill in 1928 as an eight-book series, The Law of Success is now available to contemporary readers in a single edition, redesigned and reset for ease of reading. The Law of Success is the golden key to Hill's thought--his complete and unabridged mind-power method for achieving your goals. After interviewing dozens of industrialists, diplomats, thought leaders, and successful people from all walks of life, the young Hill distilled what he learned into these fifteen core lessons, organized with an introductory chapter, 'The Master Mind,' that serves as a primer to Hill's overall philosophy. As Hill saw it, these lessons work as a "mind stimulant" that "will cause the student to organize and direct to a DEFINITE end the forces of his or her mind, thus harnessing the stupendous power which most people waste." 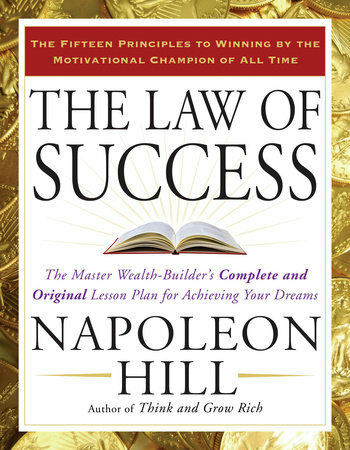 While future classics of Napoleon Hill would inspire millions of readers, there is no substitute for The Law of Success for everyone who wants to grasp the full range of Hill's ideas and tap their transformative power.